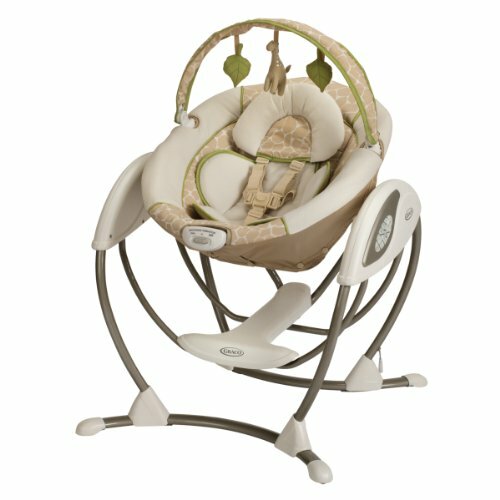 The Graco Glider LX is a unique gliding swing that soothes with the same gentle motion you use when cuddling and comforting baby in your nursery glider. For your convenience, this innovative gliding swing has a compact frame that uses 40% less space than other leading swings, and for flexibility you have the option to plug-in or use batteries. A plush, roomy seat with removable infant supports and vibration will keep baby cozy, while music will keep baby entertained. With the Graco Glider LX, you have all the features you want in a swing, but with the gliding motion baby knows and loves. The Glider LX offers multiple options for gliding, so you can keep your baby contented no matter what her mood. Six gliding speeds and two vibration settings allow you to relax and soothe baby, while 10 classic melodies and 5 nature sounds provide plenty of fun. The extra-cushioned seat, three reclining positions, and plush head support ensure that your little one will always be cozy. A removable toy bar keeps baby entertained and delighted, while a 5-point harness keeps kids safe.